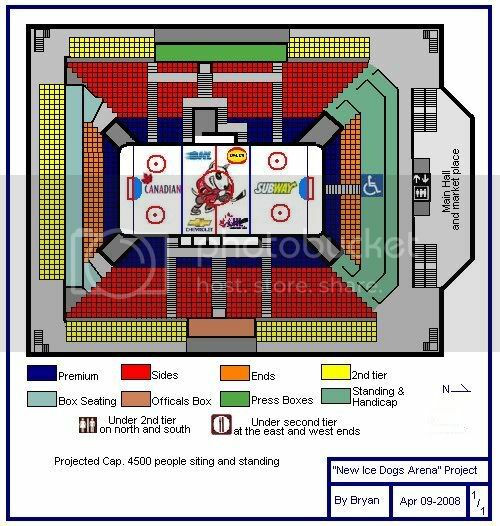 the NEW ARENA talk thread - Page 10 - Niagara IceDogs Fan Forum ! Question. Seeing as were on the topic...If the city were to level the jack and put a new arena in its place, where would the dogs play? aren't they already levelling niagara falls mem, so that eliminates that. So what are we left with....Thorold arena? The 4 pad? From what I was told by another fan, we'd play in the Falls for a year. The 4-pad only sits 1000 so that's useless. As much as I'd want the new rink to remain downtown, there's just no bloody parking within walking distance (which is a lot shorter in the icy winter than in the warm breezes of summer). NICE!! Haha I love the Title Block in the bottom right. You going to do up a bill of materials with that? I also LOVE the idea of the 2nd tier curving around like a C. Very nice. But I would prefer more seats. 3500 lower bowl, 2500 upper (or 4000/2000 - maybe 3500/1500 for 5000 total), with curtains that can be lowered over the top teir in case of lower attendance, to keep that 'intimate' atmosphere. WAIT WAIT WAIT.. I take that back We can't have tiny little ends like that - other rinks are like that where they have tons of seating on the sides, then only a couple rows at the ends, and it makes it look GLOOMY overall. Wow Bry4n! IT LOOKS GREAT! Don't think your attention to detail will go unnoticed on this forum! The Niagara Falls arena is supposed to be closed (torn down) in just over a year. The Falls is building a new 4 pad that is scheduled to open for the 2009-2010 season. So next season is supposed to be the last. If anyone plans on moving there for a year they better move quick.